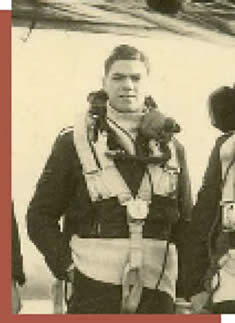 Pilot Officer Mark Anthony Hamilton Davis. "Dave", Royal Air Force, from King's Heath, Birmingham, - Aged 20, 619 Squadron Lancaster 1 ME846 Code PG -C took off from Dunholme Lodge June 21, 1944 and was shot down over Postel, Belgium at approx 1:20 am on June 22 1944. P/O "Dave" Davis died - his body never recovered. P/O Davis is commemorated on panel 211 of the Runnymede Memorial. 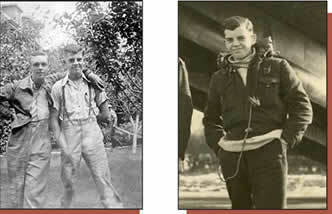 Brother of Dudley Hamilton Davis also known as "Dave" with Squadron (shot down 1940) Read: "Into the Silk"
when he was eight years old, and the family moved to Bearpark. 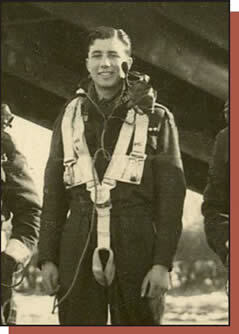 1941 at the age of 18, and received his wings in 1943. he and the crew flew many sorties together, until that fateful day in June when they were shot down over Belgium. After initially receiving help from the resistance, Dennis was eventually was captured, and was a POW in Stalag Luft 3 until the end of the war. On being demobbed, Dennis undertook a government training programme in place for returning men and women, and he chose to become a painter and decorator, eventually becoming a sales executive in later years. He married Lettie just after the war, and they had an only daughter, Anne. They also had two grandchildren, Richard and Elizabeth,to whom Dennis was to speak of his time in the war, the only time he did so in any detail. Dennis sadly died in his late sixties. "To those who loved him, he will always live"
In memory of "Porky"his brother, Clifford Bowering used his column space in the Kingston Whig Standard to publish John McCrae's "In Flander's Fields"every November 11 – Remembrance Day. It is Clifford's son, Chris Bowering, who has been actively involved in preserving his uncle's memory. Sergeant Aug. 1943 - Posted to RAF Silverstone flying Wellingtons, forming the nucleus of a bomber crewJan. Jun 1944 – Body never recovered On Lancaster 1 ME 846 took off from Dunholme Lodge June 21 1944. Shot down over Belgium, June 22 1944 - Bladel Woods, Nr. Postel Pilot Officer Davis was killed, his body never recovered. He is commemorated on panel 211 of the Runnymede Memorial. Chapter 5 of the book: "Into the Silk"written by Ian Mackersey. PDF: "Looking for Captain Davis," Belgium, September 1 - 3, 2006. No. 2 Air Observers School, Mount Gambier. Further training: Port Pirie - South Australia, Number 1 Air Navigation School, Nhill, Victoria. Trained in Avro Ansons Sailed May 5 1943 Matson liner - Sydney to San Francisco. June 30, 1943 - Parade - March Past US Army Commander. June 30-July 1 1943 - sailed on Queen Mary troop ship via Forth of Clyde disembarked Greenock, train to Brighton. Further training at Penrhos, Turweston, Silverstone, Scampton, Winthorpe, Syerstone. Flight Sergeant Peter Knox 619 Squadron - part of Bomber Command's Five Group On Lancaster 1 - Registration ME846 Code PG-C took off from Dunholme Lodge June 21 1944. Shot down over Belgium and escaped with the help of the Belgium Resistance. Essex-Royal Air Force. George Harry Moggridge was born on 20th December 1924, in Mile End, London. His father, George Percy Moggridge, worked in the London Docks. His mother's name was Clara. As a boy he loved anything to do with aircraft and flying, "He always had a model aeroplane in his hands”. He was also a keen member of the Boy Scouts. At family "sing songs"around the piano the scouting song "Riding Along on the Crest of a Wave" was his favourite. Not surprisingly as a much-loved son, George was called "Sonny"in the family. He had two older sisters (Mabel and Violet); exact whereabouts unknown, but it is known that Violet married an American -Jim Rolf who worked for the Ford Motor Company in Dagenham. We believe his last civilian address was 99 Lillechurch Road Dangenham where he lived with his parents until he joined the RAF. He was unmarried. On Lancaster 1 Registration ME846 Code PG-C took off from Dunholme Lodge June 21 1944. Shot down over Belgium, June 22 1944 (KIA) - Bladel Woods, Nr. Postel. He now rests in Schoonselhof Cemetery, Antwerp Plot IVA , Row F Grave 16 having been brought there from nearby Deurne. 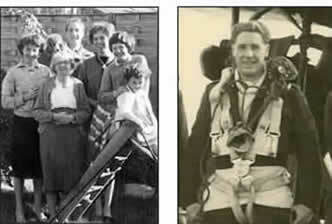 When Peter Knox arrived back in England 1944 he visited the Moggridge and Newberry families in Barking Essex. The families had become friends. George Moggridge's memory has been kept alive by his cousin Gerald Moggridge who kindly contributed the above information. This was given to him by Aunt "Peggy"who remembers George as a youngster. Sergeant Thomas Alfred Newbery –Wireless Operator from Chadwell Heath, Dagenham, Essex – Royal Air Force. Thomas Alfred Newbery was born on March 5th 1923 at Isleworth, Middlesex and his birth was registered in the Brentford District. His father Edward Alfred Newbery was listed as being a railway line keeper and his mother's maiden name was Waters. Having joined the Royal Air Force Thomas Newbery was part of a crew that trained on Short Stirlings with 1661 Heavy Conversion Unit [HCU] at RAF Winthorpe, Notts before transferring to 619 Squadron at RAF Dunholme Lodge, part of Five Group RAF Bomber Command. Flying on Lancaster 1 – Registration ME846 Code PG-C that took off from RAF Dunholme Lodge on June 21st 1944 and the aircraft was shot down by a German night-fighter over Belgium. Sergeant Newbery is believed to have been the last person to bale out of the crashing aircraft and he landed in a tree possibly damaging his arm. He was captured by the Germans and became a Prisoner of War in Stalag Luft III and was repatriated to England at the end of the war. On August 17th 1946 aged 23 Thomas A Newbery [Editorial Clerk] married Jean Spears aged 19 [Typist] of 24 Bernard Street, Lincoln at All Saints Parish Church Lincoln. On the Marriage Certificate Thomas Newbery’s father was listed as a decorator living at 16 Freshwater Road, Dagenham and Jean Spears’ father was listed as an Engineer living at 24 Bernard Street, Lincoln. Thomas and Jean are believed to have briefly lived in Dagenham [perhaps at No.1 Dunkeld Road, Dagenham, Essex]. Sadly Thomas became ill and he and Jean moved back to Lincoln to live with the Spears family on Bernard Street. Aged just 26, Thomas Newbery died on July 5th 1950, at 24 Bernard Street, Lincoln; of Hodgkin's disease. The death was reported by his father in law Mr Spears and on the Death Certificate Thomas Newbery’s occupation was listed as "Publishers Advertisement Compiler". Thomas was buried on July 8th in the Spear’s family grave at St Swithin’s Cemetery, Washingborough Road, Lincoln, 1950, plot C17. In 1953 Thomas Newbery’s wife Jean married again; Jean and Ivor Ball later moved to the south of England where they had a daughter. Jean died in July 1998. We are still hoping to receive further information about Thomas Alfred Newbery. Leslie and Eileen Taylor's Golden Wedding Anniversary July 1996 with their sons Alan, Norman, Simon and daughter Hilary Leslie Edwin James Taylor was born in Cheltenham, Gloucestershire on 10th October 1922. 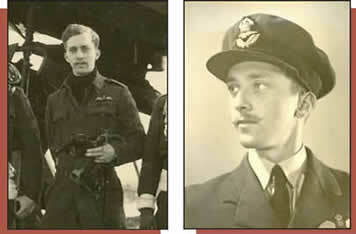 He joined the Royal Air Force as a volunteer after his elder brother, Norman, was killed in action. He was in RAF 114 Squadron and stationed at Horsham St Faith in Norfolk. 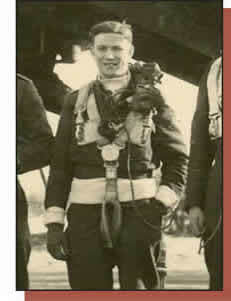 He was flying in Blenheim Mk4s and took part in many secret sweeps over France. He was killed in his aircraft on April 28th 1941 while it was returning from a shipping patrol over the North Sea. 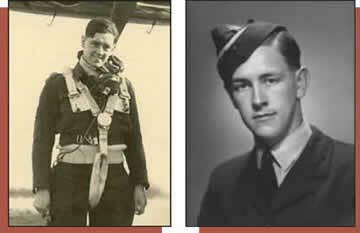 Leslie Taylor trained as a navigator with Royal Air Force - 619 Squadron, part of Bomber Command's Five Group. On Lancaster 1 ME 846 took off from Dunholme Lodge June 21 1944. Shot down over Belgium June 22 1944 was captured and made POW at Stalag Luft III. He was later made a Warrant Officer when he was repatriated in 1945. He married Eileen Davis on 23rd July 1946. There are four children: Norman, Alan, Simon and Hilary. Leslie (or ‘Tag' as he was known to the crew) trained as a teacher and began a career which spanned thirty years, the last ten of which he was Headmaster. Sadly he had to retire in 1978 at the age of 55 because of ill health. His courage and determination helped him to carry on with life in a limited fashion and he and Eileen happily reached their Golden Wedding in 1996. Leslie died on 9th July 2001, just two weeks before his 55th Wedding Anniversary.